DeepSoul: The Jones Girls - "You're Gonna Make Me Love Somebody Else"
This still-catchy track ensures the trio's place in R&B and dance history. The legendary label Philadelphia International introduced Philly Soul and an impressive roster of artists--Teddy Pendergrass, Harold Melvin and the Blue Notes, The O'Jays, and The Stylistics, just to name a few. 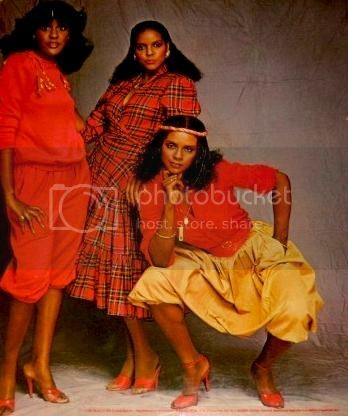 But one group deserves more recognition for singing one of the best R&B/singles of the late 70s: The Jones Girls. Their club-friendly tune "You're Gonna Make Me Love Somebody Else" is a classic Kenny Gamble/Leon Huff composition with a thumping beat, sung by an accomplished trio. The Detroit-born Jones sisters--Brenda, Valorie and Shirley--grew up in a music-filled household, their mother being Detroit-based gospel singer Mary Francis Jones. After recording singles on small local labels during the 1960s, they discovered that session work better paid the bills. As they built a reputation for their golden voices, The Jones Girls got their big break when an arranger for Diana Ross recommended them as backup singers for Ross' upcoming tour. This exposure led them to a meeting with Gamble, who signed them to his Philadelphia International label. The Jones sisters sang backup for numerous artists such as Lou Rawls and Jean Carn before they finally released their self-titled debut LP in 1979. Right out of the gate, the track "You're Gonna Make Me Love Somebody Else" became a top five R&B hit and peaked at number 12 on the dance charts. The infectious beat, sassy yet harmonic vocals, and feminist-tinged lyrics make it a standout from the waning days of disco. Beginning with a thundering groove propelled by drums and bass, the song gradually introduces The Jones Girls, who initially sing in perfect unison: "You gonna make make me love somebody else/ If you keep on treating me the way you do." Clearly these women are following Gloria Gaynor's example in "I Will Survive," that they will not tolerate being neglected. Continuing singing the same note, the trio becomes sassier as the song progresses: "I ain't dumb I ain't stupid/ I know you need love/ Need love like I do," they croon. Finally they begin harmonizing on the important lines: "'Cause if you ain't lovin' me/ I want to know who in the world you're lovin'." As the relentless beat continues, along with keyboards emphasizing the rhythm, the trio continues their brash interpretation of Gamble and Huff's memorable lyrics. How many women can empathize with lines such as these: "I know you got to make money/ But you gotta bring you loving home"? It's interesting to note that men wrote these words, as the lyrics are from a distinctively female perspective; the Jones women repeatedly sing the words "I don't wanna do it, I don't wanna do it," suggesting great reluctance at having to move on. Unlike Gaynor's "I Will Survive" persona, The Jones Girls project a mixed sort of feminism; the narrator suspects her lover is cheating on her, confronts him, yet retains mixed feelings over ultimately leaving him. "I need love just like you do/ Tell me who you've been giving it to/ I'm gonna love somebody," the singers harmonize. While experiencing success with "You're Gonna Make Me Love Somebody Else," which propelled their album to number eight on the R&B charts, their sales gradually declined with each new album they released. However, their 1981 LP Get as Much Love as You Can produced a future cult hit, the mid-tempo "Nights Over Egypt." Eventually The Jones Girls split as a group, with Shirley later embarking on a solo career. Any hopes of a reunion ended with Valorie's death in 2001, but the still catchy "You're Gonna Make Me Love Somebody Else" ensures the trio's place in R&B and dance history.